Important Note: Investment Fund is an investment product and some Investment Funds would involve derivatives. The investment decision is yours but you should not invest in that investment product unless the intermediary who sells it to you has explained to you that the product is suitable for you having regard to your financial situation, investment experience and investment objectives. 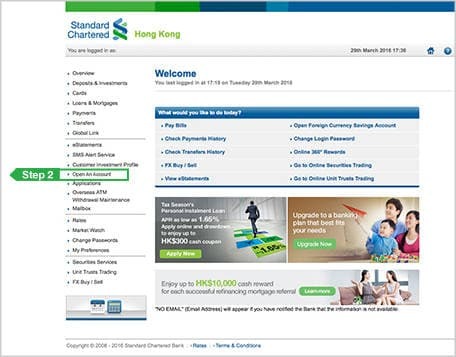 Standard Chartered Bank (Hong Kong) Limited provides execution-only trading service over Online Unit Trusts and shall not advise you on the merits of a transaction, nor ensure the transaction is suitable for you. *Securities Services Account with application submitted by 5:00pm HKT will be ready for service on the next trade day. ^Relevant terms and conditions apply. Step 2: Choose "Open an Account"
Act now and enjoy the fabulous offers! The promotion period is from 2 January to 30 March 2019, both dates inclusive (the “Promotion Period”). 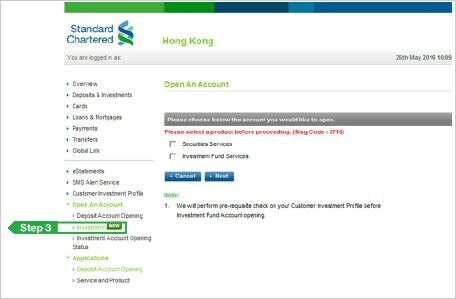 The 0% Unit Trusts Offer is applicable to client of Standard Chartered Bank (Hong Kong) Limited (the “Bank”), excluding Private Banking client, Commercial Banking client and Business Banking client (the “Client”). To be eligible for the 0% Unit Trusts Offer, the Client must sign up for new Investment Fund Account through Online Banking and not hold any Investment Fund Account with the Bank (either in sole name, joint names as primary/secondary account holder) within the past 6 months prior to the signing up for the Investment Fund Account through Online Banking (the “Eligible Client”). During the Promotion Period, Eligible Client may be entitled to 0% subscription fee for the first subscription transaction (up to HKD100,000 or equivalent transaction amount or in case where the amount of the first subscription transaction exceeds HKD100,000 or equivalent, 1.5% subscription fee will apply in respect of the transaction amount that exceeds HKD100,000 or equivalent and flat 1.5% subscription fee for all subsequent subscription transaction(s) completed through Online Unit Trusts platform during the Promotion Period). Current Account. The account with latest opening date will be selected if more than one account is found under the account type. For non-HKD denominated subscriptions, the subscription fee and rebate amount (as applicable) will be calculated based on the transaction amount converted into HKD using the prevailing foreign exchange rate on the relevant transaction date as determined by the Bank. The 0% Unit Trusts Offer is only applicable to Class A funds (funds with subscription fee charged upon purchase). Fund switching, Monthly Investment Plans and subscription through any other channel are NOT eligible for the 0% Unit Trusts Offer. The Investment Fund Account and relevant settlement account must still be valid at the time when the subscription fee rebate is credited; otherwise, the subscription fee rebate will be forfeited. The Bank reserves the right to alter, extend or terminate the promotion and amend these terms and conditions at any time without prior notice. In case of disputes, the Bank’s decision shall be final and binding. If the Eligible Client is entitled to the offer(s) in this promotion in conjunction with other promotional offers, the Bank reserves the right to grant the client one of or part of the entitled offers only. Upon subscription, the Client will be subject to Suitability Assessment which may lead to unsuccessful online order placement. For more details, please refer to the FAQ. Investment involves risks. The prices of units / shares of unit trusts or mutual funds fluctuate, sometimes dramatically and may become valueless. Investor may not get back the amount they have invested. It is as likely that losses will be incurred rather than profit made as a result of buying and selling unit trusts or mutual funds. Past performance is no guide to its future performance. Investment involves risks. The prices of securities fluctuate, sometimes dramatically and may become valueless. Past performance of any securities is no guide to its future performance. Investors should consider their own financial situation, investment experience, investment objectives and risk tolerance level, and read the terms and conditions of relevant Securities Services before making any investment decision.